It’s All Greek to Her Hannah Palmatary '18 spent the summer discovering the ancient ruins of Greece as well as her own talent and passion for creative writing. Hannah Palmatary ’18 spent the summer discovering the ancient ruins of Greece, as well as her own talents and passions. 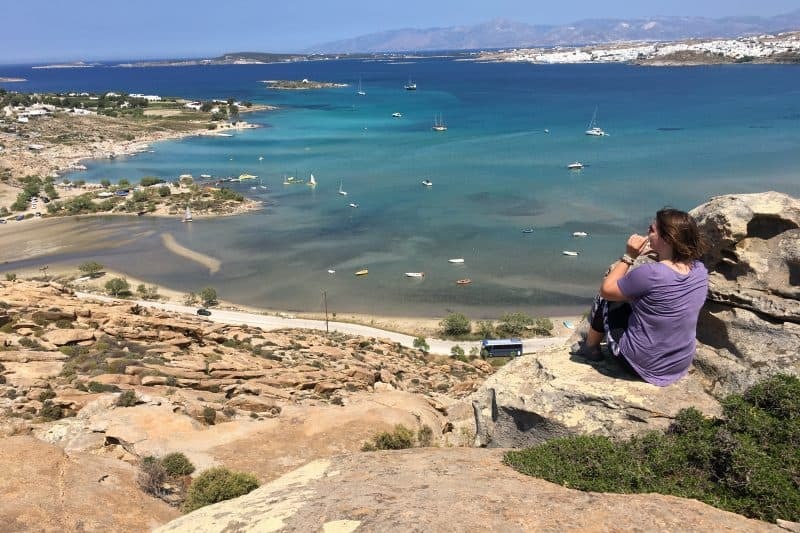 I spent my summer traveling throughout Greece as part of the Hellenic International Studies in the Arts program, exploring the history, art and culture of the Cyclades in order to enhance my skills as a creative writer. I enjoyed developing my own personal narrative, and taking in and transcribing those of the people on the Greek islands. I worked one-on-one with two mentors to aid my understanding of the nation and the development of my poetry and prose, which I crafted while inspired by the ancient country and its equally timeless people living in the modern world. My time in Greece allowed me to further understand a stark and brilliant quality of humanity – the ability to tell, craft and live by stories. The whole trip was a lesson in storytelling, both by artistically recognizing of the lives of those around me and in the growing and understanding of my own personal story. The Johnson Opportunity Grant and additional support from Hellenic International Studies in the Arts helped me fund my summer experience. Additionally, the generous Keelty Scholarship allows me to attend Washington and Lee. I’d like to thank W&L for providing such excellent opportunities for its students. Q. What was your favorite aspect of the location? My experience took me all over Greece, although my main “home” was the town of Parikia on the island of Paros. I particularly enjoyed the immediacy of history on the island. The ancient effortlessly blended with the modern. You could reach out and touch thousand-year-old marble buildings, walk down streets built before the United States existed, and hike a bit to find bygone mines or temples to Apollo. And my apartment was right next to the beach! 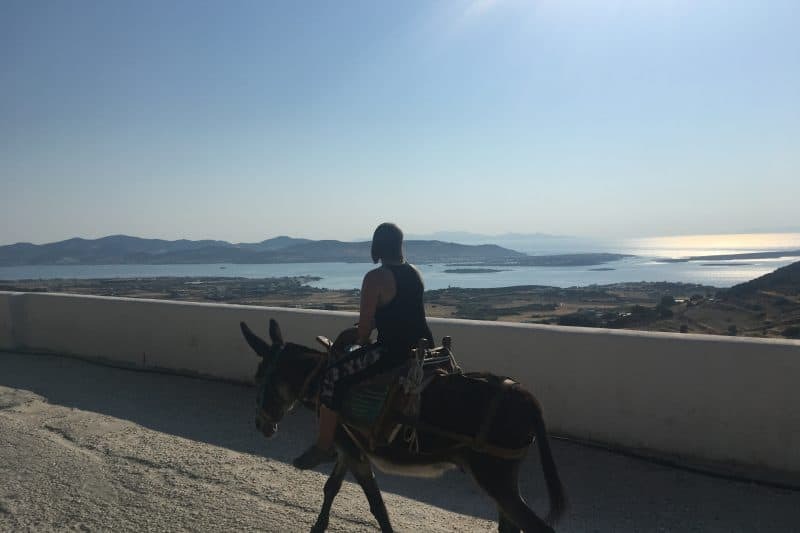 Hannah Palmatary ’18 overlooking the beach in Greece. In the morning, I would wake up and walk along the beach and harbor for a little more than a mile to get to the school. There I would meet up with my mentor, Ioannis, an Athenian archeologist who specializes in art and ancient culture, for about two hours to discuss the sites we would see that day. From there, we’d either hike or ferry to the site. Once at the sites, we had our own time to explore the unique history of the place, and I often used this as a time to write, inspired by my proximity to the ancientness, its mysterious bygone qualities, and its visiting people. After that we’d return to Parikia where I’d grab something to eat from the local vendors and restaurateurs I’d come to know and write a bit more, sometimes asking them for a bit of wisdom or history if they’d share it. I liked to write in the early evenings somewhere in town because the weather had cooled by then, the people were out and about, and you could always see the sunset over the Aegean. Around 6 p.m., I would meet with my writing mentor, George, for two hours or so and we’d discuss what I’d written the day before. I’d read it out loud and we’d just discuss for hours. I wrote every day so there was always something new to look at and some novel bit of his insight to gain. After that, I would walk home along the same path and settle in for the night or go into town again with some friends. We often had group dinners with the other students and mentors in the program — it was like a big Greek family! I always had a journal on me in which I would scrawl ideas throughout the whole day, and, at night, I’d expand some of these ideas into stories or poems as well. Q. If you can choose one part of your experience that was the most rewarding and fulfilling, what would it be? My time in Greece inspired me to believe in my own work and my own talent. It’s hard to love something that many people tell you is a risky career pursuit, especially in an increasingly focused and specialized society, and if there’s one thing I found the most rewarding it was that I now truly believe in my own writing and storytelling abilities. I was able to delve very deep into my creative mind during my time abroad, and that has been endlessly fulfilling. The language! I’ve traveled before but never somewhere that uses a completely different alphabet. Nothing sounds like or looks like English, but that was all part of the adventure. I had two mentors this summer. My mentor for Cycladic Art and Culture was Ioannis Georganas, who originally hails from Athens but now conducts research at St. Andrews in Scotland. Ioannis was the go-to person for any question about Greek society, new or ancient. In addition to uncountable facts about old and new Greece that I learned thanks to him, I also now have a vast appreciation for the history of human kind and the progression of civilization. He taught me to value our own past and heritage, as this is what most inspires and creates our future. W&L has instilled in me the values of being present in my own life, and these skills have stuck with me as a traveler and as a writer. W&L has provided the space for me to become caring enough to not just flitter by a place or a person in a tourist-like selfie-taking haze. I think many students in other schools just check boxes and follow a routine, but at Washington and Lee we are encouraged to immensely care about the things we do, love the people we interact with, and value our own time and life. In my mind, W&L provides us with the ultimate skills to travel, to live a life of care, and to be inspired. What I will bring back is a renewed sense of possibility. Getting to know the people of Greece and the land itself, I know that humanity has the tenacity to spring back from anything—financial recession or ancient war or religious conversion. Greece has been an epicenter of strife for thousands of years, but it is also, as one of the birthplaces of western civilization, a testament to the heart of mankind. With that in mind, I feel that I can bring back to W&L my own refined writing abilities and knowledge of Greece, but also the renewed and deepened ability to encourage and support my fellow students and community. This experience has inspired me to officially declare a creative writing minor in the fall and apply for graduate opportunities such as grants in the field. Additionally, I would like to pursue publishing opportunities for the collection of poetry I wrote while abroad. It seems very easy in our modern lifestyle to get so focused on a specific track in life, to finish this major and go to this graduate school and work for x, y, or z company. An experience like my time with Hellenic International Studies in the Arts allowed me to break from this notion and understand myself more fully. It has also, I believe, helped me understand what it means to be human more fully. Living a life where you go speak with a farmer every day in order to cook your meal, where you are walking on streets built before time was counted, when you are allowing yourself to be inspired by small things and small hours; consequently, to create, to place yourself at stake in your art and ultimately your life, that is the most important thing we can do, as W&L students and as anyone of this up-and-coming generation. Hannah Palmatary ’19 rides off into the sunset.